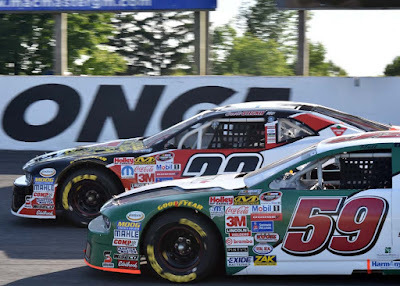 NASCAR Canadian Tire Series added the Innisfil track to the 2015 schedule after the Barrie Speedway was sold and closed down. 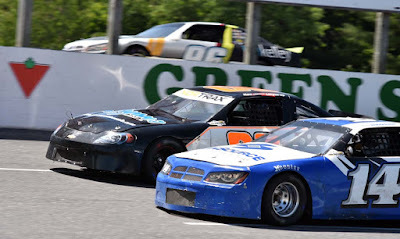 The tiny asphalt oval of only 0.333 miles featured the Leland Industries 300 race presented by Johnsonville on Saturday, June 20, 2015 with 300 laps and an elapsed time of 1 hour, 27 minutes. This was the inaugural NCTS event at Sunset and Quebec driver Alex Tagliani (top photo, centre) of the #18 EpiPen/CGI/CanTorque Chrevrolet car won the event, followed by Jason Hathaway (top photo, left) of the #3 Brakework/Fast Eddie/HGC Chevrolet one lap down and Cayden Lapcevich (top photo, right) of the #76 Tim Hortons Dodge who also took home the Pinty's Wingman of the Race Award. Cayden is so young they took away his champagne after he popped the bottle and joined in the spraying of the winners at Victory Circle.Much was made about the fact that Alex lapped the entire field and he also won the Mobil 1 driver of the race award as he clinched his second win in NCTS. "The race was green flag Lap 21 to Lap 287, which led to the field easily getting strung out on the .333-mile oval. 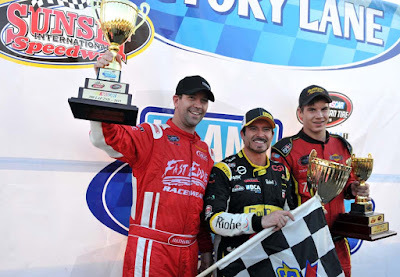 Even though Hathaway received the free pass under the last caution, he had no shot to challenge Tagliani with just a few laps left in the race as he would have had to restart at the tail end, so he elected to pit for fuel along with everyone else and protect his position. 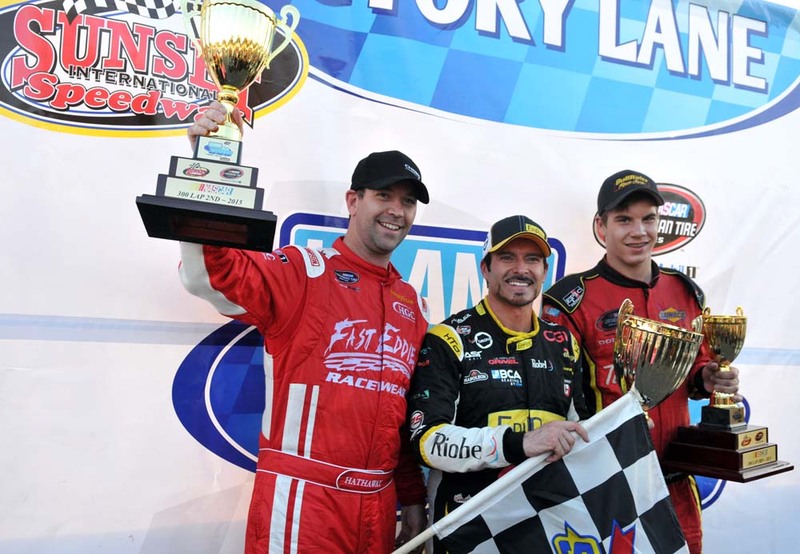 Thus, even with the late-race caution, Tagliani’s victory was essentially a foregone conclusion." 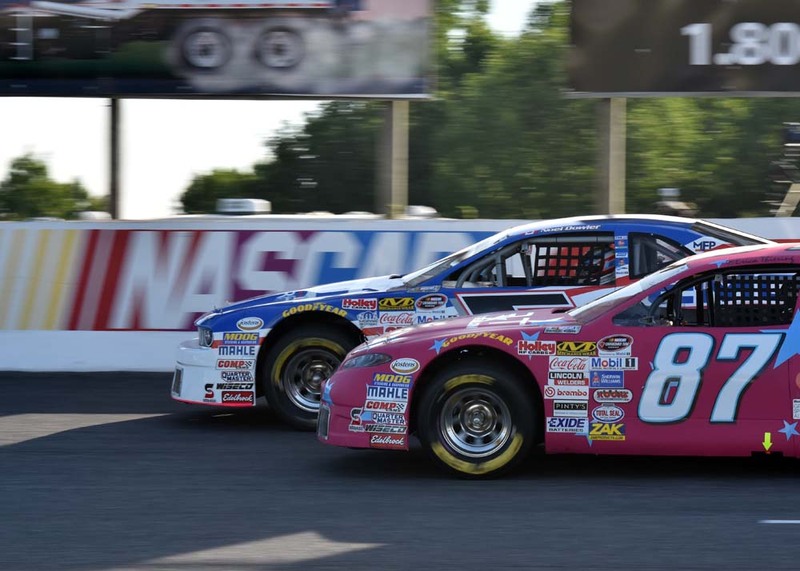 Gary Klutt was the polesitter with a 14.758 second qualifying time, finished 6th in the #59 CTL Corp/Thermal Technology Services car. 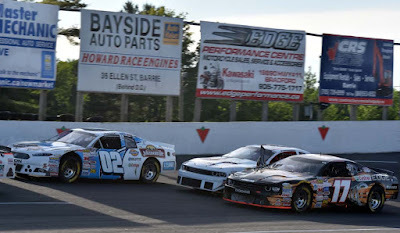 Sunset Speedway General Manager Mark Dilley joined the on-track race in the #2 Johnsonville/Leland/Dickies Ford. 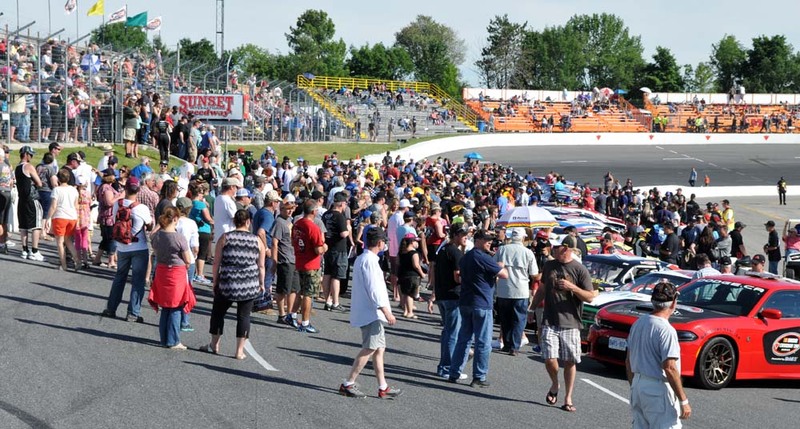 The track has joined the NASCAR Whelen All-American Series and is only the third track in Canada with weekly NASCAR sanctioned racing. Also up on the bill was a Pro Challenge race - Canada's full size racing action in 3/4 scale stock cars. "The Ontario Pro Challenge Series is a traveling division visiting five to six tracks across Ontario giving drivers a variety of venues to hone skills and service sponsors. 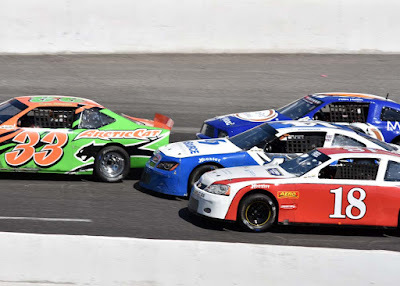 A season consists of twelve point races typically mid-May through mid-September. The schedule is built to provide a balance of enough racing to satisfy while offering free time to enjoy other summer activities." Dennis Thomson of the #2 car won the race followed by Patrick Freel of the #18 car and Michael Westwood of the #91 car finished 3rd. 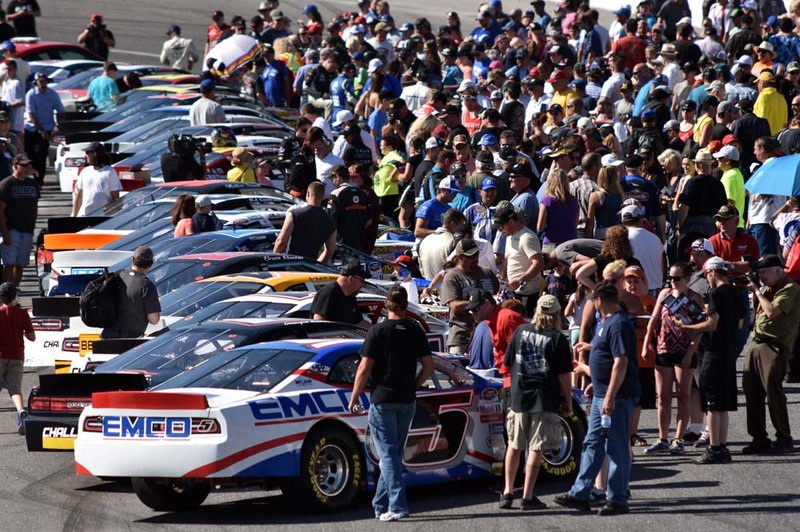 The race day starts early on Saturday with officials meeting at 7:00am, then registration opens and the haulers bring in the cars. NCTS technical inspection runs from 9:30 to 11:30am. 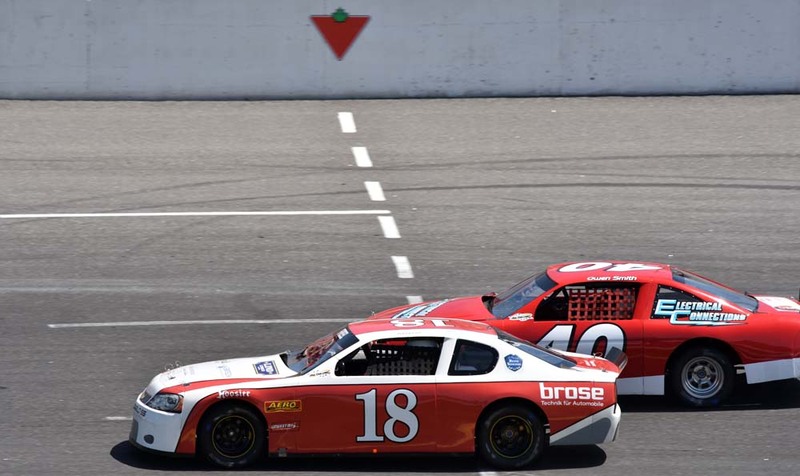 The first practice was the Pro cars at 11:00am followed by the first NCTS practice. 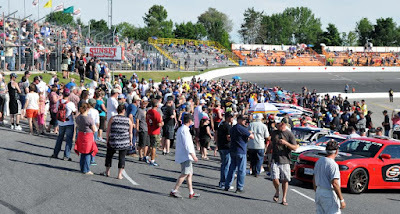 The Pro Challenge Feature started at 4:20pm followed by the NASCAR Canadian Tire Series autograph session at 5:00pm. Finally the green flag dropped for the Leland Industries 300 presented by Johnsonville at 6:30pm.